Honolu is set down a sloped street right next to the end of the skywalk leading from Ebisu Station. The counter can seat six people if everyone squeezes, but luckily they also have some Japanese-style low tables set away for small groups in the loft. 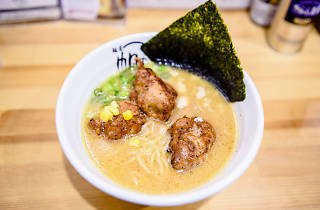 The main attraction here is chicken-based halal ramen, made with ingredients certified by the MHC (Malaysia Halal Corporation) and with quite a few options to choose from. These include some more creative ventures, such as Tom Yum or Karaage ramen, although it seems like they retired their very green pak chee ramen. We had the fried chicken ramen, which was topped with good-sized chunks of chicken (more pan-fried than deep-fried, although there was definitely a hint of flour) and had a nice depth to it. 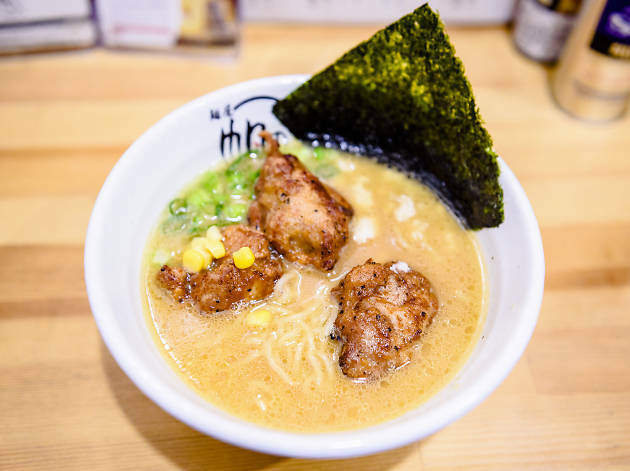 The broth was denser and heavier than you'd expect from your average toripaitan chicken soup, and was closer in taste to a classic miso or tonkotsu ramen – albeit a non-haram version. A special mention goes to their halal-certified Nikkoken gyoza, which are made with chicken and tofu. As self-declared gyoza aficionados, we ordered a plate each (who wants to share? ), and with the prices very reasonable (ramen is ¥780-¥980, gyoza ¥580), it won't even put a massive dent in your wallet to do the same. In the evening, their menu expands to include takoyaki, sukiyaki and other more substantial dishes. There's also a small praying corner tucked away in the loft. Honolu have a few branches across the city and one in their native Osaka, but note that only the ones in Ebisu and Osaka serve a halal menu (and also serve non-halal ramen, but always made with separate utensils, on separate workbenches and served in clearly marked bowls).